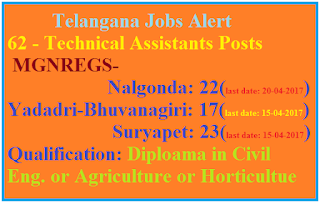 The District Rural Development Agency(DRDA) on behalf Society for Rural Development(SRDS) Service, O/o CRD, Hyderabad seeks applications from young energetic, pro-poor and dynamic candidates to work as Technical Assistants in MGNREGS Scheme implemented by Rural Development Department(RDD). 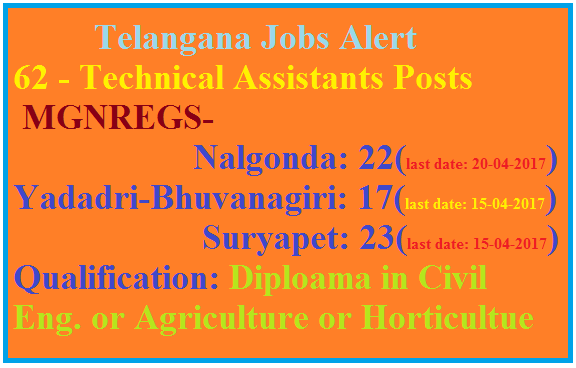 Who are applying to Technical Assistant post those Candidates shall be willing to work any place mandal in their Native Districts. The Candidates recruited as Technical Assistants will be a fixed Tenure Employee having contractual agreement with Society for (RDD) Rural Development Department.